After having finished up two weeks of my transportation theme last week I find myself realizing that I really need to crank out a bunch more questions for my Question of the Day Bundle, especially since I need the questions for my classroom fairly soon. So I started with some space themed questions even though we are not doing a space theme this year at my school. When making my questions I really like to incorporate real life photos so that the questions are interesting as well as possibly showing my students something they have not seen before. I do have a couple students who can read a bit, but for the most part my assistant or I read the question of the day to our students. This year I don’t seem to have too many students who just want to answer what other students are choosing. Last year I had a few who always wanted their names to be next to a buddy’s name, regardless of the answer choices. One of the student jobs in our classroom is the Question of the Day Helper. That person goes over to the pocket chart and counts the responses and reports them to the circle so that we can discuss them. We talk about most, least, unanimous, and ties. Just today we had a unanimous answer, although it would not have been if all of my students had been there since the question was about whether there was a letter H in anyone’s name. I just finished up another set of questions for this bundle, with space, hibernation, friends, Valentine’s, and healthy habit themed questions. Since I am very concerned with making sure that the photos and graphics do not print poorly, the latest version of the bundle includes a link to a Dropbox file with set six in it. January 20 and 21 is a sale day at Teachers Pay Teachers. My Question of the Day Bundle as well as everything else in my shop will be on sale. Make sure you remember to use the code above. 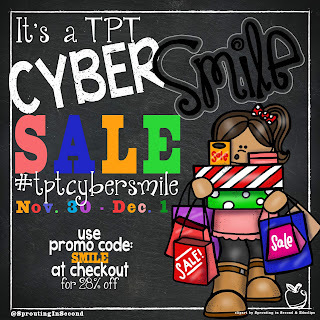 You can click through to the sale using the graphic above. I am making a concerted effort to make sure I have some engaging science activities in my classroom this year. Having a dedicated science table and a coworker who will ask what I am doing for science this week is helping keep me accountable. Earlier in the year I had a magnetic/not magnetic center in my classroom, so my students knew a little about magnets already. I wanted to revisit magnets during transportation week since I already had the fishing game ready that used magnets as well as having magnetic trains to play with on the small train table. My younger daughter helped me with this center by making masking tape paths for the students to try to make their train cars travel along using the magnet wands (Amazon referral link so you can see which ones we have). I showed the students how to make the magnet wand push the train cars without touching them and then asked them to try it out. One student was fascinated with this center and brought the materials over to the door at dismissal to show one of the parents how it worked. He had also figured out how to make the two magnet wands fight to keep away from each other. We discovered that the best way to make this center work was to have the magnet wand sliding along the table. Otherwise the train car sometimes rotated to the side and stuck to the magnet. What kinds of activities do you use in your science center? We are now officially back to school after our Christmas break. I spent some time over the weekend getting my room set up for our theme of Transportation. The other PreK teacher and I worked together to come up with two sensory bins so we can trade them for the second week of the theme. Above you can see the fishing for transportation items bin. The pictures of land, air, and water transportation items are laminated and have a few staples in each of them. The staples make the magnetic fishing poles be able to catch them. In the past I had tried having magnets, either buttons or magnetic tape, on the back, but then the magnets tended to fall off. The students catch the item and then place it on the correct mat for where they would find it. The students enjoyed using this center today and the teaching assistant enjoyed not having bunches of sensory bin items all over the floor to sweep, especially since we had peppermint rice in December which ended up everywhere. In the picture there are wheel shaped pasta (Amazon referral link to get a closer look at the type of pasta) added in for some fun. What theme are you starting 2016 with in your classroom? Just before Thanksgiving my coworker and I attempted to plan the entire month of December together. I will admit that I did a good job of getting this coming week planned, but only have a general idea of the rest of the month. I am grateful that my coworker wanted to plan this way, though, because it will really make the rest of the month much easier. I decided that I wanted some fun fine motor practice for my students this month. We have done a few q-tip painting activities in the past, mostly focusing on making the shapes of the letter of the week. 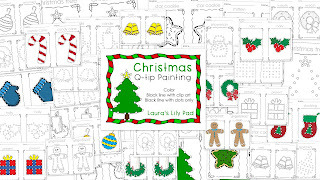 The set I created involves dot painting along the outlines of Christmas related drawings. I will probably use the black line with the clip art this time around in my classroom. 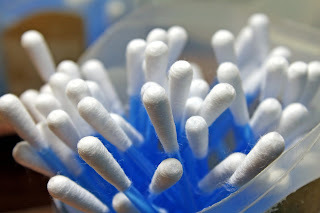 To use these printables I provide q-tips or other cotton swabs and a small paint palette with a few colors of paint as well as a paper towel to set used swabs on. There are a few students who really like to mix colors, so I do need to remind them that these are shared paints for the center and that mixing is not a choice. I will try to make sure I do have an activity in which those students who like to mix paint will be able to mix during an art project, if possible, during the week. Otherwise, I will try to let my happy mixers be the last to use the paint at the end of the last centers time so that they can mix to their heart’s content. Teachers Pay Teachers is having a site wide sale Monday and Tuesday, so make your wishlists now and be sure to check out one of those days. I have a few items I want to purchase myself and need to decide how much I can budget. Some are just to use in my classroom and some are to make items to use in my classroom as well as add to my store. 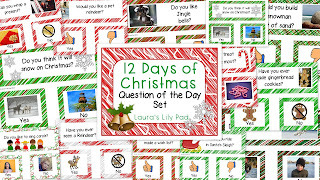 Thanks to an awesome customer I have twelve new questions for the holidays for my Question of the Day Bundle. Between these questions and the ones already in the bundle I am sure I have plenty for the entire month of December. I may end up making a few more, though, since we are focusing on the five senses during December and I may want to have a few questions that relate the senses to Christmas. I am also planning to switch my pretend play from a Construction Site to a Post Office, so I have a bunch of work to do before Thanksgiving so that I don’t feel overwhelmed when I get back. I need to pack up the golf tee nails, the sand paper, the wood, tool sets, and construction vests. Since I am planning to move my writing center into the Post Office I need to pick up a bunch of Christmas cards from the dollar store to stock that part of the center. After a break from Laura’s Lily Pad to get my school year started, complete a college course on Play and Learning, and deal with some family issues, I now am dusting off my blog and sharing my classroom photos of my new Ocean Friends PreK classroom. I started out the year with an ice cream shop in my dramatic play area. The freshly painted wooden kitchen pieces were donated by a family from my church and were painted by another member of the church. My director made most of the decorations when she did this dramatic play area in her classroom in year’s past.